The Piggles live in the bustling and picturesque village of Pigglemere, which is nestled deep in the heart of England’s Lake District. Squiggle and his twin sister Wriggle are six years old, and Giggle, their toddler brother, is nearly three. Giggle is often accompanied by his rag pig and confidante, Likkle Piggle. The characters were created by Alan Dart and Malcolm Bird in 1998, and made their debut as fabric toys, designed by Alan, in Woman’s Weekly magazine. 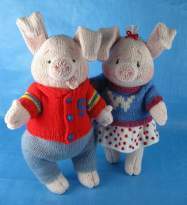 Now, for the first time, and exclusive to this website, you can buy knitting patterns to make your own Piggles. The toys have moveable limbs, so they can sit or stand, and wave their arms, and the clothes are knitted separately for dressing-up fun. 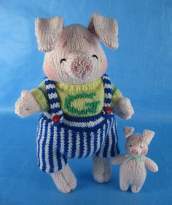 There are two patterns – one for Squiggle and Wriggle, and the other for Giggle and Likkle Piggle – which are available singly, or for a reduced price if you buy both. To celebrate the festive season, you can also make removable dressing-up costumes to fit the four Piggle toys pictured above. Squiggle has a Santa suit, Wriggle is a pink fairy, Giggle is dressed as a pixie and Likkle Piggle is a spotted toadstool. If you have already made the Piggles then these outfits would make a splendid addition to their wardrobe. Please note that this pattern is for the clothes only. 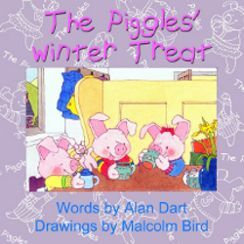 The first in a series of eBooks, written by Alan Dart and illustrated by Malcolm Bird, entitled The Piggles’ Winter Treat, is now available from the iBookstore for only £2.99. It can be viewed using iBooks on an iPad, iPhone or iPod touch, or any ereader that supports the epub format. For download instructions, please read the information regarding iPads on the FAQ page of this website. Click on the arrow below to see a short YouTube film which shows a few pages from the book, accompanied by The Piggle Prance, a theme tune written especially for The Piggles by their friend Peter Polycarpou. Click on the button below to be redirected to the iBookstore to buy your copy of the Piggle eBook. 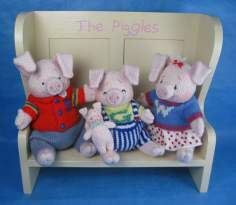 For the latest information about the Piggles, including background details, animated videos of the original Piggle toys, and personalised Piggle greeting cards, visit Malcolm Bird’s website by clicking here. The Piggles™ characters, names and all related elements are trademarked and copyright 2018 Malcolm Bird and Alan Dart.